Which countries do you support for membership payments? We use Paypal for processing credit card payments, so payment can be made from the 200+ countries that Paypal supports. However, some countries aren't supported. Here's Paypal's list of supported countries. We accept Via, MasterCard, Maestro and Solo cards. Users wishing to pay via American Express can select the Paypal payment option and use their card via that. Anyone wishing to use a different card can always pay via PayPal. You can be confident that your payments are 100% secure. We use industry standard 2048 bit secure encryption for transactions - shown by the padlock in the browser bar. All payments are through PayPal - we don't store your details. You don't need to register with PayPal if you pay by credit card. Can I stop my subscription part way through the billing period? 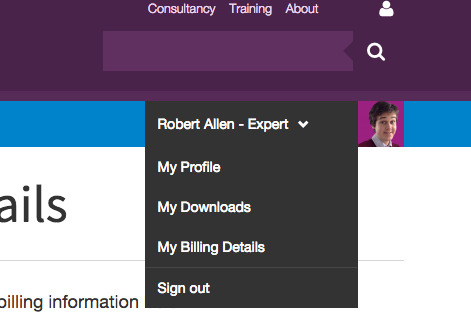 Yes, you can cancel your Expert membership plan at any time via the View Profile option (Top Right) when signed in - you will retain Expert membership until your current billing period expires, and it then won't renew automatically. All membership payments are made in US dollars. This means your bank will convert the currency for you at whatever the local exchange rate is. Some banks will charge a small fee for currency conversion. The most common verification problem is where there is a mismatch of addresses for the credit card. This is often caused by a recent move where the address on file has not been accurately updated. Checking the address you’ve put in to make sure the billing addresses matches the address on your card should solve this. If you have other problems, please contact us and we will look into it straight away. When you first pay or renew, a receipt is sent to you by Email from Paypal, our payment processing service. Members can also print an invoice for accounting purposes from the View Profile> Purchases and Receipts page when signed into the site. This option is only available to members who joined recently, otherwise, please contact us forwarding your original joining date, amount and address to show and we will create an invoice for you. To cancel your membership, first log into the site, and then select ‘Billing details’ under your profile options on the right dropdown. At the bottom of the billing information tab you will see a link to cancel your membership. You will be able to keep using your membership until the period expires, at which point it will not renew automatically. We offer a 30-day money back satisfaction guarantee, although it's very rare for members to request this due to the range and quality of resources available! We can't offer an unconditional guarantee since it would be possible for a new member to download all our templates and guides and then ask for a refund. So, we do set a condition that you can access a maximum of 2 Expert resources within the 30 day period in order to qualify for the refund guarantee, which gives new members an opportunity to download and review the quality and relevance of our resources. If you subscribed some time ago and did not want your membership to renew then we can we can arrange to have your most recent payment returned to you. This is on the condition that you have not downloaded any resources during the period which you didn’t intend to have the service for. If you have downloaded anything during that period we will not be able to refund you. You can see full details our Terms and Conditions page that members tick to agree to before subscribing via the payment form.